Gone, gone gone are the days of when joining the school band meant struggling through Hot Cross Buns, with aspirations of Let’s Go Band by the Winter Concect! We’re almost 2 decades into the 21st century here folks, and our kids are ready to handle the not-so-modern technology of electrified instruments. 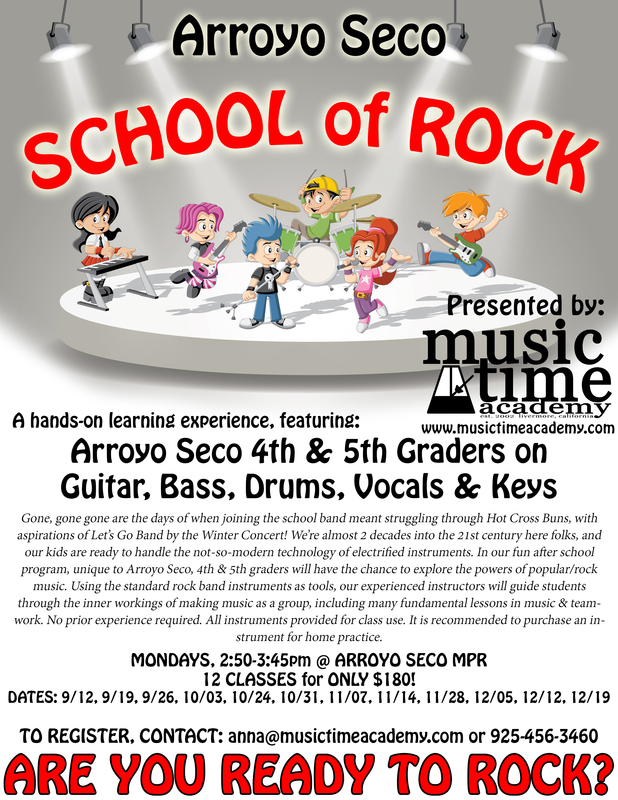 In our fun after school program, unique to Arroyo Seco, 4th & 5th graders will have the chance to explore the powers of popular/rock music. Using the standard rock band instruments as tools, our experienced instructors will guide students through the inner workings of making music as a group, including many fundamental lessons in music & teamwork. No prior experience required. All instruments provided for class use. It is recommended to purchase an instrument for home practice.